The Bronx doesn’t get a lot of love for its pizza, which is ridiculous, because, um, it should get a lot of love for its pizza -- especially when it comes to these nine pie joints that sling everything from white and Salerno-style pies, to some classic, greasy, New York slices. It has arcade games, glowing neon signs straight out of the '70s, a mismatched mix of cheesy brick and cafeteria tile... what we’re saying is, it has it all. This is your consummate greasy pizzeria, the kind of great-but-not-blow-your-mind-exceptional place that every neighborhood deserves to have. 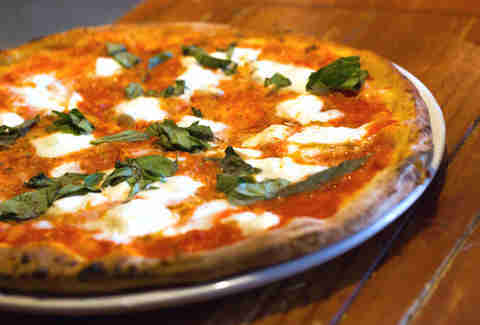 The pizza is big, oily, and, though the crust could use a facelift, it’s pretty damn good. This is Sushi Nakazawa honcho Alessandro Borgognone’s family restaurant, the place where he cut his teeth before serendipitously watching Jiro Dreams of Sushi. It appears to be a classic Italian-American spot, but it’s more sophisticated than it looks. The thin crust pizzas are cooked in a wood-fired oven visible through a glass partition, and while they're clearly Neapolitan-inspired, they don’t fit neatly into that category. The back-to-basics Regina, a classically simple mix of buffalo mozzarella and sweet tomato sauce, is the move you wanna make. The pizza at this red sauce institution, which has anchored the neighborhood for more than 90 years, is also one of NYC's best under-the-radar pies. Most people come for the calamari and eggplant Parmesan and totally miss the pizza, which's nonchalantly listed on the menu as an appetizer. (Ask nicely and you can get a large.) 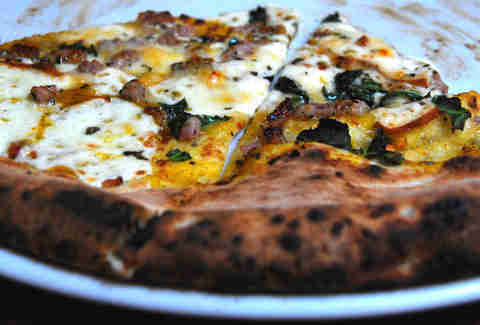 Order it and you’ll be rewarded with a chewy, well-charred crust and one of the borough’s finest New York-style pies. 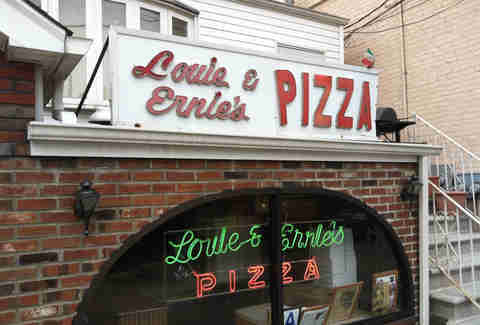 There is pizza in the Bronx, and then there is Louie & Ernie’s. Located in a charming house in quiet Schuylerville, it’s a bona fide cheese-and-bread-disc destination, and touted by the likes of noted pizza authority Ed Levine and pizza obsessive turned pizza-preneur Adam Kuban. The white pie, with its mix of pillowy ricotta and gooey mozzarella, is one of the best in the city -- but if you don’t get the sausage (made with chunks of fennel links from nearby S&D), you’re doing it all wrong. A popular local pit stop conveniently located right off the 5 train, this shop serves typically big slices (the Bronx is home to the jumbo slice, which is just a huge slice.) The crust is thick and porous, the sauce is properly sharp, and the stretchy cheese molten. 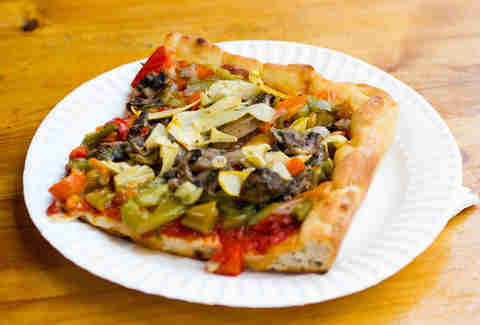 It’s satisfying and straightforward -- a pull-no-punches example of the classic New York slice. A lot of people talk up Full Moon, but the truth is those cornmeal-dusted slices don’t hold a candle to these thick-crusted Sicilian beauties, mostly because they don't have arms and thus holding a candle would be SUPER challenging, but also because they're just not as good. That said, this isn’t your typically bread-y square slice: these pan-baked bastards have a crisp shell and a reasonably portioned crust. There are usually well over 10 options to choose from, but keep your eyes on the prize and gun for the fully loaded ones. Think thinly sliced eggplant, salad slices with artichoke, and roasted red pepper. Emilio’s is located smack-dab in the heart of Morris Park’s Italian neighborhood, which locals will tell you is the "real Little Italy of New York" and not Arthur Ave. Right or wrong, Emilio’s serves up a very fine, aggressively garlicky white slice with islands of ricotta surrounded with stretchy mozzarella. 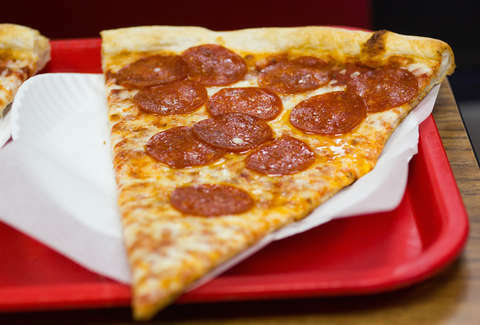 Pizza evangelists consider the plain slice to be the standard by which all pizzerias should be judged. Gourmet pizza aficionados know this is the false truth of narrow-minded fools. Unsurprisingly, the plain here does not inspire, but once you get into toppings territory, it’s game over. Moist, lemony chicken cutlet with fresh tomato is a winner, as is the rich shrimp scampi. While most gourmet slices can’t handle their heft, this pizza’s thick (but not overly bread-y) crust provides support for scarfing.